Where are you from? Your profession? I was born in Washington, DC. Since my Dad was in the Navy, we traveled extensively, and I lived in various cities in Europe, US west and east coasts, Bermuda, and finally Florida. I’ve had a 25+ year career with the State of Florida as a Computer and Information Systems Manager, providing all aspects of support for network systems and personal computers for my team scattered throughout the state. When and how did you become interested in paddling? I’ve enjoyed paddling for more decades than I like to admit, mostly in canoes. Once I discovered kayaks about 10 years ago, I’ve only gone back to the single paddle once or twice, although I suppose some of the new lightweight canoes would be enjoyable. 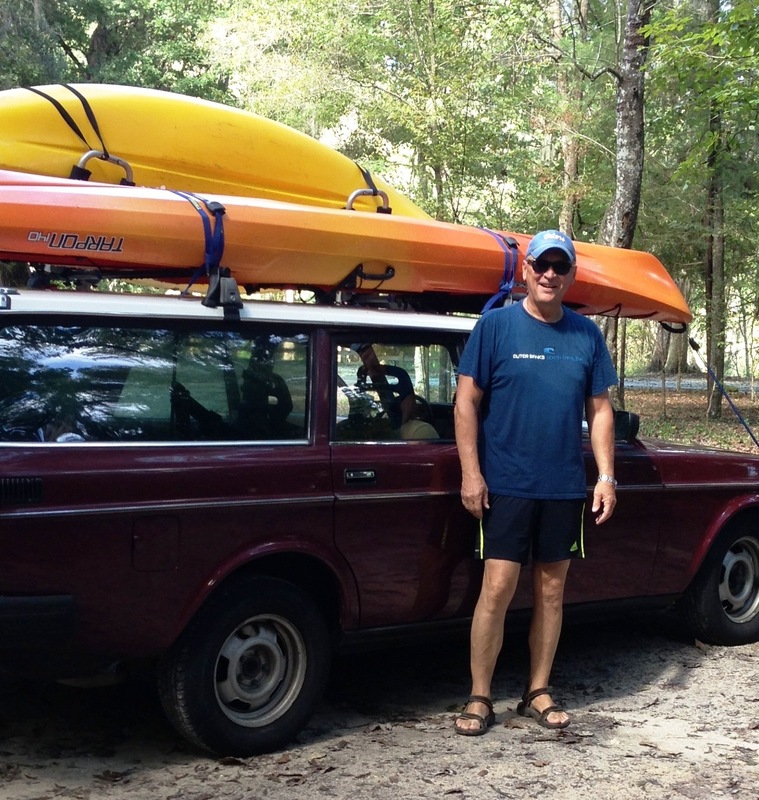 I started out with the typical recreational kayak, renting them for day trips from local outfitters on the Ichetucknee, Santa Fe and at Cedar Key, Florida. After figuring out that I really liked paddling, I started purchasing…and I guess you can’t have too many kayaks, can you? My paddling these days is mostly a mix of touring where I can enjoy the serenity and beauty of nature, and fitness days. I’ve begun to take an interest in events in other states too, like the South Dakota Kayak Challenge. Where is your favorite place to paddle? We have so many wonderful locations here in Florida, it’s difficult to choose. I guess I would have to select the islands of the Gulf coast and in the Cedar Key area. There are almost always dolphins to be seen. After a nice day on the water, you can return to the quaint charm of Cedar Key and its great restaurants for the evening. What’s the most interesting thing that ever happened to you on a paddling trip? That would have to be my “Elvis adventure!” My neighbor and long-time paddling buddy Phil and I were on our first trip to Alexander Springs on a very warm November morning. After several miles, that beautiful spring run begins to get “thready” and you have sections of very narrow waterways under canopied forest. The wildlife was great. We saw many different birds, a raccoon, and the gators were numerous. After heading down a dark and narrow thread of maybe 30 feet across, we heard a voice crying out “Elvis! Elvis!” The call became louder as we continued to paddle along and we joked that maybe we would soon be hearing the strumming of banjos. Suddenly, two camouflaged and very tired looking hunters popped out of the palmettos along the bank. “Mister, we’ve been tracking our dog all night. He swam across this water to that little island where he’s been baying for hours. He was taught not to swim in the water, but he got caught up chasin’ a deer. Now he’s afraid to come back across, and we’ve been watching that gator up there a bit swim back and forth watching him. Think y’all can get him back over here?” Phil pointed and volunteered that maybe I could as my WS Tarpon had a large rear deck. I paddled over to the bank and tried to get the dog to step onto my boat. He would come close, but wasn’t having any of it. I was able to pet him a couple times, but he wouldn’t climb in the boat. Maybe a treat would entice him? I reached into my lunch cooler and brought out a can of expensive imported tuna in olive oil. He became curious. I put a little on my hand and he licked it. Slowly he came closer until he was eating out of the can, at which point I grabbed his collar and dragged him into my rear deck. 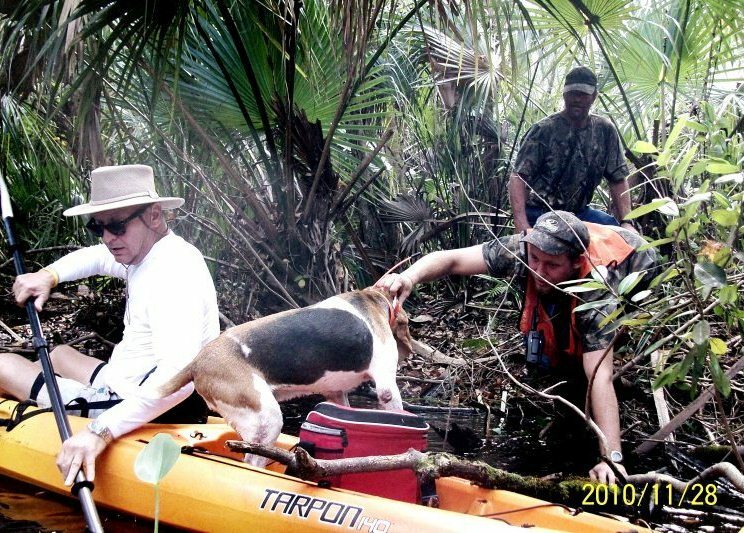 Now the hard part: restraining a large struggling hound dog who wanted out of the boat, keeping an eye on a gator who wanted a meal of its own, paddling with only one spare hand! 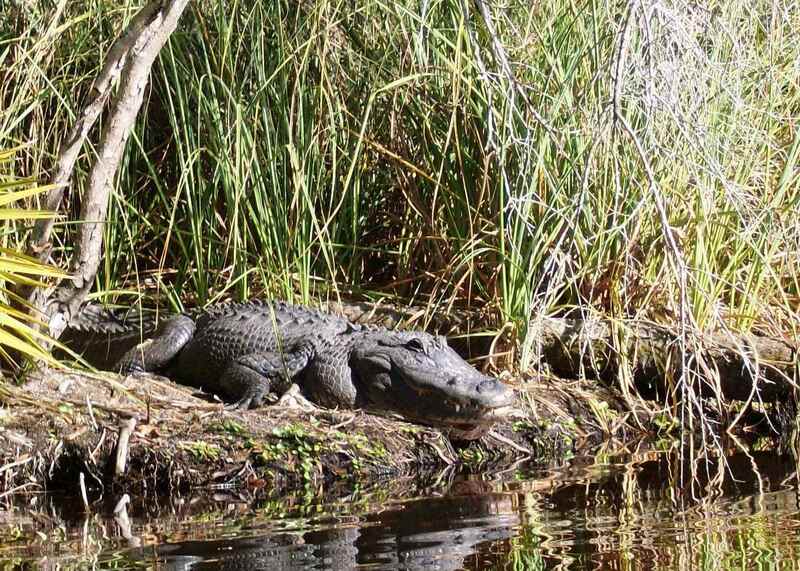 As Phil paddled back and forth to keep the gator at bay, I flailed my way to the bank where one of the men reached out and snatched up Elvis by the collar. Safe at last, Elvis was happy to be back with his owner and his owner was even happier that Elvis still had his expensive tracking collar. Oh yeah, Elvis got to finish off the tuna. How many Paddle Florida trips have you gone on and to where? I guess six or seven. I’ve done the Suwannee numerous times, which sometimes includes a day on the northern Withlacoochee and sometimes the Ichetucknee; the southern Withlacoochee with the beautiful Rainbow River and the Gulf; and the great Florida Keys. Every trip is different every time. You can experience different water levels in the rivers, calm waters in the Atlantic, or some choppy conditions, but it’s all about the experience and adventure. What keeps you coming back? I asked myself that after about the third trip or so! First off, you meet some interesting people from all over the country, and then you also catch up with some of the other “regulars” who have done a lot of trips too – some paddlers have done them for years and years. It’s great to sit around and swap stories and adventures after the day’s paddle is done, and learn of other paddling places to travel to that you might never have considered. The fact that all of your gear is transported for you and your delicious meals are catered really adds a nice touch. Sure it’s fun to do a trip where you pack your own food and gear, but for a trip of more than a couple of days you really have to eat light. On a Paddle Florida trip the food is plentiful and good! Can you describe a Paddle Florida trip highlight? At first I used to try to complete the day’s segment quickly. On the water early, see the sights along the way, out and set up camp - just like many folks tour when they take a road trip. Later, I realized that I come on these trips to paddle and soak up the experience and the local environment. On my last Suwannee trip, I stopped at every spring as usual, but this time I got out and swam in them. Getting wet and exploring the springs is just a wonderful experience that you can’t re-create at an amusement park. Some folks even bring fishing gear along for fun. What advice do you have for folks considering a Paddle Florida trip? If you’ve never done one, don’t wait anymore! No expensive or fancy lightweight gear is required. You’ll meet fellow paddlers from all kinds of different experience levels, and you will find fellowship among them. With the exception of the Florida Keys trip, you’ll be going downriver so paddling is hardly needed most of the time. Bring a folding camp chair to enjoy relaxing in camp, listening to evening entertainers and speakers, and later for around the campfire. Oh, and don’t forget your camera!